Cosmetic acupuncture is a form of therapy for the facial skin that has its roots within the tradition of Chinese medicine and has been practiced for at least a thousand years as a method of enhancing the youthfulness of appearance. Once the reserve of emperors and empresses, today it has garnered a diverse group of devotes from professional actors and actresses to non-professionals simply seeking its benefits due to increased levels of public awareness and accessibility. Similar to therapeutic acupuncture, the modern technique of the procedure involves the virtually painless insertion of tiny, sterile needles into specific areas of the skin in which regenerative effects are desired. Though results will vary according to an individual’s general health, age, and lifestyle, among other factors, noticeable changes in appearance normally begin to manifest within the course of approximately 5-6 individualized treatments. 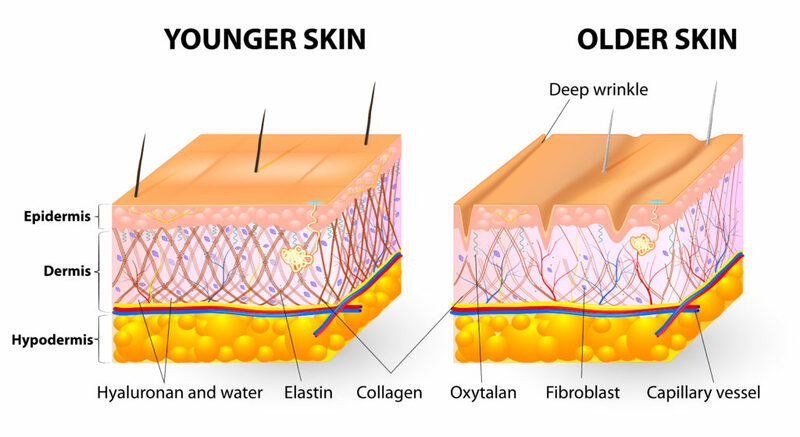 Aging affects the skin in various ways. Structural changes involving the depletion and degeneration of its constituents leads to changes in its appearance that are characterized by wrinkles, dullness, dryness, and sagging. The factors responsible for these changes are complex and comprise a mixture of both internal (genetics, cellular metabolism, hormone and metabolic processes) and external (damage from sunlight, pollution, and ozone) elements. While it is not possible to halt these natural processes, it is possible to reduce the speed of their progression and, in some cases, temporarily counter their effects. 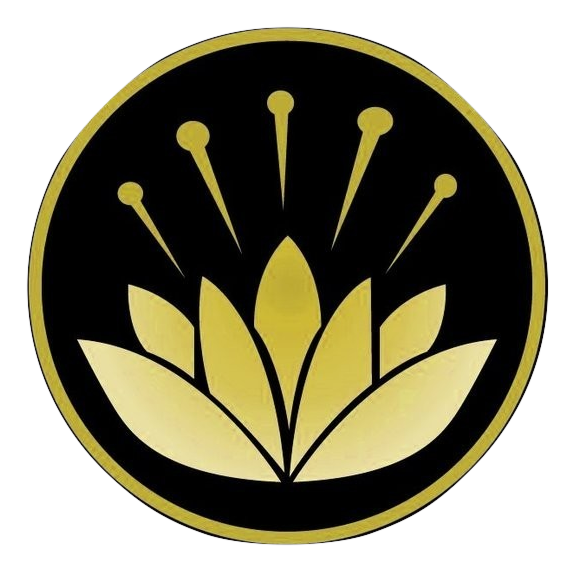 Chinese medicine, and cosmetic acupuncture in particular, attempt to naturally achieve these goals through the stimulation of the innate regenerative and healing abilities of the body and its skin. As is the case with conventional acupuncture, there are many hypotheses regarding the actual biophysical mechanisms involved in cosmetic acupuncture. While research into the exact processes is not as developed as it is in the case of standard acupuncture, insights gleaned from the existing database of conventional acupuncture studies, as well as from other relevant bio physiological investigations, allow for the proposal of several mechanisms. One of these relates to the body’s production of the chemical compound adenosine. It is known from animal studies that dermal needling can lead to a localized release of adenosine,3 a compound which is known to stimulate the production of skin firming collagen 4 through its activating effects on fibroblasts.5 Properly placed, such needling can also stimulate the genesis of other matrix proteins through its mechanotransductive effects upon cells within tissue.6 Acupuncture also appears to have the ability to increase the number of dermal fibroblasts, as well as other cell types.7 Taken collectively, these abilities are likely to be involved in at least some of the beneficial effects. In research conducted to evaluate the regenerative effects on skin of a medical procedure that involves needling, levels of collagen and elastin production were histologically demonstrated to have been positively affected. Percutaneous Collagen Induction Therapy (PCI) is a medical treatment in which a roller which has been embedded with thin needles is repeatedly rolled over an anesthetized patient’s skin leading to the creation of a very high density of perforations. It must be emphasized that, in contrast to the targeted approach of cosmetic acupuncture, PCI therapy is not targeted upon individual wrinkles but involves the creation of thousands of individual perforations over a region of skin. As such, the results quoted above in relation to PCI cannot be extrapolated to describe those that may be expected through cosmetic acupuncture treatments. Nevertheless, such results do tend towards lending support for the conceptual validity of, and proposed mechanisms behind, cosmetic acupuncture and are quoted above in this context. 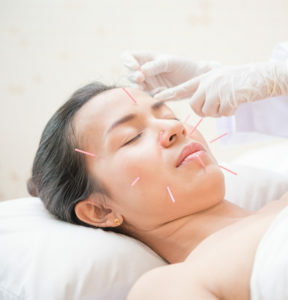 In any review of the physiological mechanisms involved in producing the effects of facial cosmetic acupuncture, the role of general body acupuncture, which almost always accompanies the cosmetic portion of treatment, must also be taken into consideration. This is because results intimately depend upon the function of a complex physiological network that involves the whole body and with its known effects on the endocrine, vascular, nervous, immune and digestive systems,12 body acupuncture can be assumed to play a powerful supportive role in the achievement of therapeutic results. Within the practice of Chinese medicine, the appearance of a patient’s skin provides important diagnostic information regarding the state of his or her general health as these elements are considered interrelated. A course of cosmetic acupuncture treatment, therefore, begins with the close examination of a patient’s complexion and is followed by a thorough review of his or her medical history as well as diet and lifestyle choices. To address any deficiencies that might be uncovered, a course of medicinal herbs may be prescribed and followed through with nutritional and/or lifestyle recommendations. Based on the result of the initial assessment, exfoliation or other preparatory procedures of the face such as gua sha might be used in order to promote lymphatic drainage and the opening of pores. Treatment would then proceed to include the recommended course of facial, as well as general body, acupuncture, as may be required, and would end with the application of a professional grade nourishing skin care product and gentle massage of the face and neck. A complete treatment regimen at our clinic will usually encompass between ten to twelve, sixty to ninety minute sessions performed at a frequency of two to three times per week. At Healing Arts, we also offer anti-aging LED light facial treatments to our clients. 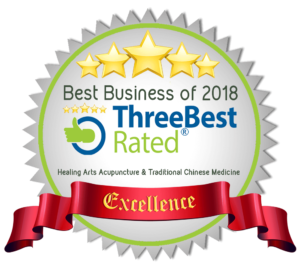 This safe and natural therapeutic modality, which produces physiological responses similar to those induced by acupuncture, can be used in tandem with our cosmetic acupuncture procedures in order to help naturally boost their effectiveness and hasten treatment response times. Dermatologist Dr. Whitney Bowe outlines some of the therapeutic effects of red and IR LED light on the Rachael Ray Show. For more information about light therapy at our clinic, please visit our LED Light Therapy page. 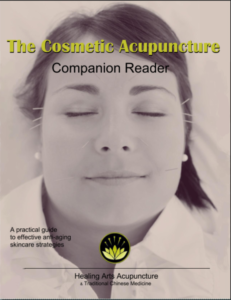 Read our Cosmetic Acupuncture Companion e-booklet here! While cosmetic acupuncture produces no undesirable side-effects in most people, those with particularly sensitive skin may experience a temporary flushed appearance of their complexion. This effect, a result of the enhanced circulation that is induced by the procedure, can be expected to resolve within a couple of hours. We suggest that patients who react in such way schedule their treatments for the evening. On rare occasions, a small amount of temporary bruising may occur around a needling point. 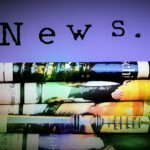 Click here for links to recent media articles regarding cosmetic acupuncture. 7 Jin-Ah Lee. Et al. “Acupuncture accelerates wound healing in burn-injured mice.” Burns. Vol 37, Issue 1. 2011. Web. 01/10/2017. 15 Bhora, FY. et al. “Effect of growth factors on cell proliferation and epithelialization in human skin.” Journal of Surgical Research. 1995. Web 01/10/2017. 16 Aust, MC et al. “Percutaneous Collagen Induction Therapy: an alternative treatment for scars, wrinkles, and skin laxity.” Plastic Reconstructive Surgery. 2008. Web. 01/12/2018.